Super Art Gifts For Kids! I’m really excited to bring you this post today because it’s dedicated to ETSY! I adore Etsy, because it’s such an amazing platform for independent sellers and gives us as buyers a great opportunity to pick up some truly unique and special items! 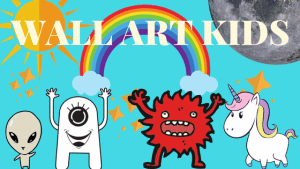 Today I wanted to look at a selection of some super art gifts for kids – for all those little art and craft fans running about your home! Etsy also has a fantastic Christmas Gift Guide for you to check out too. It was a difficult choice but there is so much to choose from on ETSY, but I decided to showcase these 12 great products for this post. Enjoy! 1. 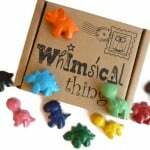 Dinosaur Crayons, (top left) £5.50 A lovely set of gift boxed dinosaur crayons. Ships worldwide from England. This super cute box set of crayons comes with 10 dino crayons included – perfect for a dinosaur fan. 2. 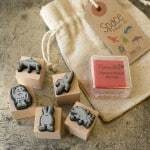 Space Rubber Stamp Set (middle top) £15.00 Great set of rubber space stamps, with ink set included, ships worldwide from England. 3. Kids Christmas Craft Set (right top) Pom poms, glitter, glue, cards, gingerbread stickers and more. 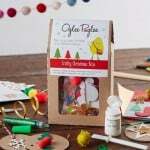 All you need to make Christmas decorations and cards! 4. 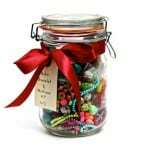 Bead jar jewellery kit (2nd row left) £25.00 An adorable little jewellery making set in a jar, perfect for making necklaces and bracelets. 5. 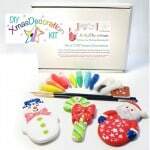 Paint your own Christmas decorations (2nd row middle) £21.00 You can make your own ceramic Christmas decorations with this kit. Make a Snowman, candy cane and Santa! Non toxic acrylic paints included. 6. 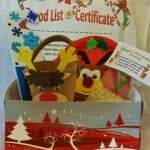 Christmas Eve Crafting box (2nd row right) £8.99 A super little craft kit for Christmas Eve – including a cute bucket for Rudolph, Reindeer treat plate, Reindeer food and more. 7. 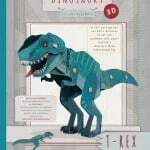 Dinosaur TREX craft (3rd row left) £7.90 Everything you need to create your own awesome Trex model. Including durable laminated paper and fasteners. 8. Asobi seedling fashion designer kit (3rd row middle) £35.00 A very pretty kit for a child interested in fashion design. Various fabrics, needles, shapes, ribbon and more included. 9. 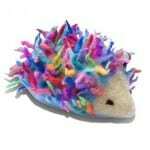 Needle craft, make your own hedghog, (3rd row right) £22.76 A super cute kit with everything you need to make your own 3D wool hedgehog. 10. Vitamin ball pens, (bottom left) £1.50 Adorable Kawaii multicoloured vitamin pens, with six different colours to collect. A cute little stocking filler. 11. Paper mache Cat Set (bottom middle) £9.95 A very attractively presented paper mache set, with everything you need to create two gorgeous paper mache cats! Simple and great fun to create – a perfect introduction to paper mache! 12. 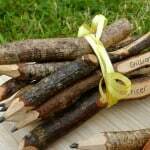 Twig personalised pencils (bottom right) £3.00 Lovely personalised pencils, that you can have personalised with your child’s name. With a natural “twig” look, they’d make a unique gift. Do you have a favourite? 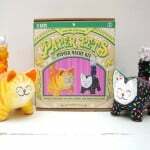 Mine is the paper mache cats set, they’re adorable! They will be the perfect gift my my son this Christmas because, not only is he a cat lover, he has yet to experiment with paper mache and is huge craft enthusiast! Leave me a comment and let me know what’s on your wishlist! Paper mache pet cats really look so cute and interesting. I would love to get one of these because I want to give it to my nephew and for my room decoration too. 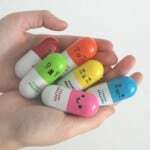 I like all the super art stuff that you have mentioned on your blog. I love this reading this blog because you come up with cute stuff. Thank you very much for your comments! Pleased you’ve seen some things you like 🙂 Merry Christmas!!! I never thought about looking at Etsy for gifts. I’ve got quite a few young children to buy for this Christmas so I’ll definitely give it a go. Thanks. Yes I really love them. Etsy has really expanded in recent years, they have some great stuff. Pleased to help, take care, thanks! Merry Christmas! These are all great gift ideas! My boys would love the dinosaur crayons.I love that they are unique and thoughtful. I also like the pill pins. They are so cute and would make a wonderful gift for anyone how likes to draw or doodle. The twig pencils would be super cute for girls who are whimsical or like fairies. Very cool gifts that I can think of for this coming Christmas! Thank you so much. I personally prefer the dinosaur TREX craft as it gives me the feel of going back to the prehistoric times! The pencil looks awesome too as you can remind people of your wishes every time they start writing! Look forward to more post from you.